Light to dark olive dorsall becoming white ven- trally; light bean-shaped horizontal markings dis- persed in oblique rows on sides; vertical fins com- monly orange-yellow. Young northern pike (under 279 mm) with oblique dark bars. Young solid black-green on back, con- trasted with cream-colored stripe on back of muskel- lunge fingerling. 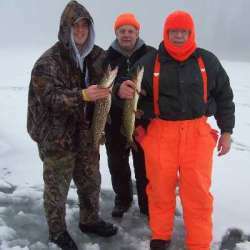 For more Northern Pike photos visit Lake-Link's Photo Gallery. In Wisconsin, the northern pike occurs in the Mississippi River, Lake Michigan, and Lake Superior drainage basins. It is widely distributed throughout the state except in the unglaciated area, where it is sparsely dispersed except in large river systems and impounded areas. 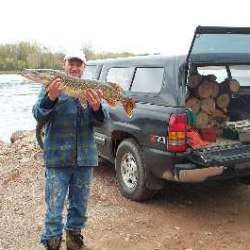 The northern pike is generally common except in the southeastern quarter of the state, where populations are seriously depressed. Spawning may occur from late March to early April, as soon as the ice begins to break up in the spring. Migrations into the spawning areas take place during the night. Spawning occurs at temperatures between 34 and 40ºF, but 36-37ºF seems to be the preferred range. Spawning takes place in flooded areas with emergent vegetation and involves one female and from one to three attendant males. Eggs are deposited on vegetation to which they adhere. There is no parental care. Unlike other common species of game fish, northern pike are most active when the water is cool. 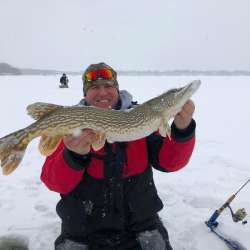 The northern pike is quite accommodating to anglers, biting best during the daylight hours. Being a predator, northerns prefer live fish baits, and wobbling spoons. They are a favorite target of ice fisherman with tip-ups. 26 lbs 15 ozs caught by Walter Klenzak caught on Strip Mine Lake on November 9, 1989. 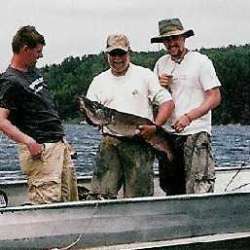 30 lbs 2 ozs caught by Jack Barnes caught on Clear Lake on January 1, 1992. 25 lbs 5 ozs caught by Allen Forsberg caught on West Okoboji, Dickinson County on February 1, 1977. 39 lbs 0 ozs caught by Larry Clough caught on Dodge Lake, Schoolcraft County on January 1, 1961. 45 lbs 12 ozs caught on Basswood, Lake County on May 16, 1929. 38 lbs 0 ozs caught on Puckaway Lake, Green Lake County on August 6, 1952.